Charles Knill-Jones is proud to head up Tula Precision Ltd. having taken over from Richard I’Anson in 2006. 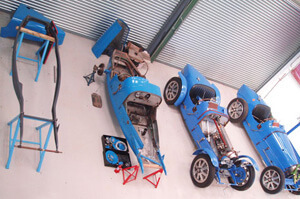 The company, Based in the Cotswolds and close to Prescott Hill, the home of the Bugatti Owners Club, draws on over 65 years of combined experience in restoration, race preparation and quality servicing of all Bugatti Cars. Richard is pleased to remain on as a consultant. Michael Whiting continues his exemplary work building all types of roller bearing crank engines, gearboxes, blowers and ancillaries to Ettore’s drawings. Michael’s skill base is second to none and includes most of the Bugatti range, he has been the core of Tula for over 47 yrs. Charles Knill-Jones BSCHons is a graduate of Materials Science at Brunel University. Upon leaving university he was employed by Nick Mason’s Ten Tenths organisation looking after his racing stable for 20yrs completing his last day for Nick in September 2017. An appreciation of vintage and historic race preparation, as well as an enthusiastic approach to the historic car world, leaves him well qualified to manage Tula. Charles has recently been on the Bugatti Owners Club affairs committee but has stood down to give time to his growing young family. Al Clark has been with Tula for 5yrs and is my No1 mechanic. He lends his hand to building up the cars and projects designated to him. Al is currently full steam on T59 BC123 and a T44. Ray Nash has re joined Tula after a 10 year absence as a commercial driver. Ray worked for Tula and our machine shop Straight 8 between 1980 & 1998. A demon machinist Ray works out in house lathe, milling surface grinder and hone. In the accounts department we have Debbie and Kate keeping us in order and full of chocolate fish! Tula has prided itself with very high quality, detailed work with the emphasis on a personal service both in competition and on the road. The workshops have relocated to a private workshop facility in the Cotswolds. Please feel free to contact us to discuss your requirements.